Father and son, yep, we were there opening day! 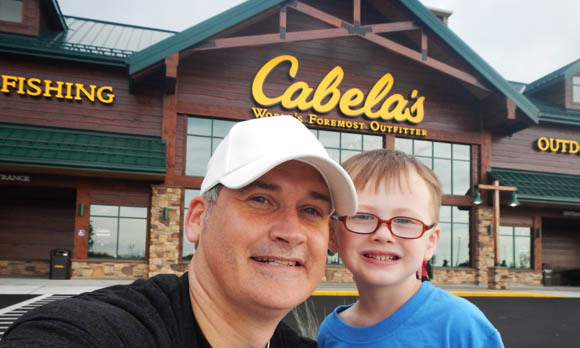 AVON, OH – In case you live under a rock or otherwise do not communicate with the outside world, a Cabela’s (www.cabelas.com) store is now in Northeast Ohio! The doors opened to the general public on August 11th with quite a bit of fanfare. Being that it was a weekday, I was unable to go early for any of the fanfare and giveaways, but I did take my son that evening. I guess I do consider this something historic, and wanted to be there on day one. 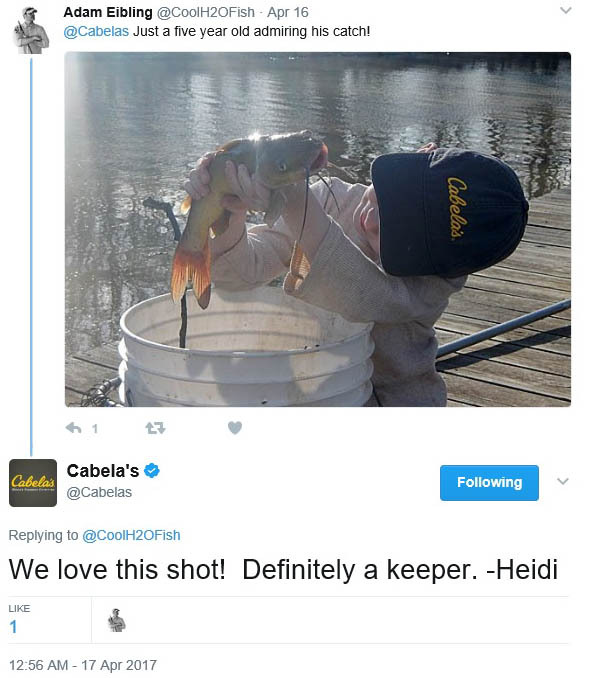 Cabela’s has a special place in my heart, which might be hard to understand without explanation. 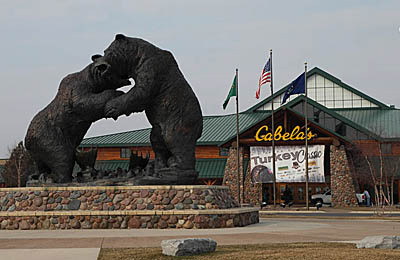 Years ago, while living in Toledo, Ohio, I came to enjoy the Cabela’s in Dundee, Michigan. I have many great memories shopping there, and fishing in the local area (River Raisin). The extended family would also do an annual fishing vacation to the Upper Peninsula, and this store was always a stop on the way for gear/supplies and our Michigan fishing license. Lastly, it was a destination that my future wife and I did a road trip to, when we were newly dating. All of these great memories, make it a bit of a landmark on the map, and my life. I am so happy they are now closer to home. I’ve managed to get to Cabelas in Dundee a dozen or so times, and thought I would do a mini overview of my experiences. While I will include some of my own photos, this link HERE will take you to the official store website. I strongly advise to monitor “view upcoming store events” if planning a visit. Arriving at the store, in the lobby there is a bragging board for the employees. 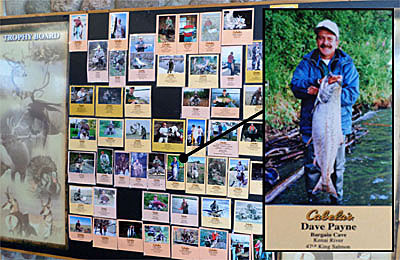 A nice collage of various staff with their exploits both hunting and fishing. I actually like this a lot. It makes me feel as though the staff actually has some interest and/or expertise in the outdoors, not simply people who landed a job in retail. 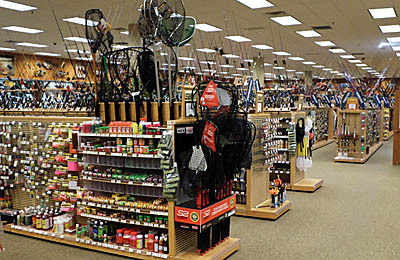 I can’t help but think of a recent experience I had in an un-named store with a big fishing section. I hear a guy ask one of the employees stocking a shelf say, “I wanted to get started in Steelhead fishing, can you help me?”. The employee says, “I don’t really fish but I can show you where the books are on it”. Needless to say, this doesn’t happen with the staff at Cabelas. Once through the lobby, you immediately see the sheer size and scope of a 225,000 square foot store. An indoor ‘mountain’ of various wildlife mounts is the center-piece of the store and is quite impressive. The walls are labeled with big signs indicating the department, which does make navigating rather easy despite the size. Small and large displays of mounts pepper the store and it does give the impression the company did not demand every square foot have products to sell. In my opinion, it does demonstrate they wanted to provide an ‘outdoor experience’ while shopping. 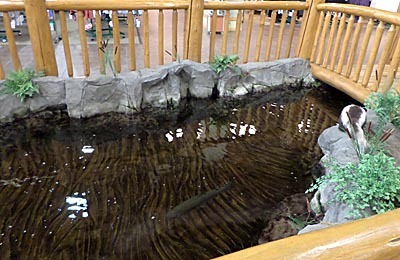 The two things I enjoy the most about the store is the indoor trout stream and the aquarium. The trout in the stream are enormous and it is neat to be so close to them. I’m positive every angler who visits dreams of winning a promotion to get to fish for them. Most of the fish are Rainbows (possibly Steelhead) with a few Browns as well. All of the fish are big and many times I have seen fish pushing 10 pounds or more in the stream. If you get tired from shopping, this is the place to sit and rest. 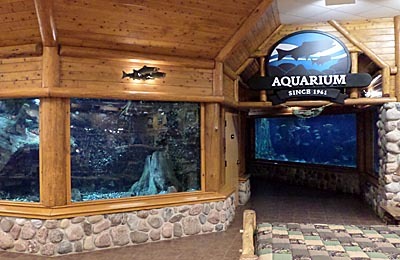 As for the aquarium, it rivals or is superior to any section that a zoo might have devoted to freshwater fish. 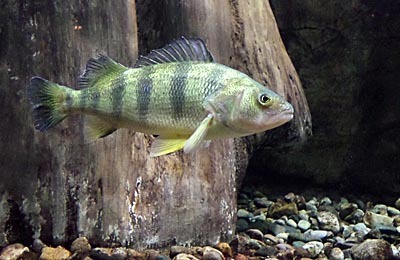 What I love the most is that it has the fish that are native to the Great Lakes region. 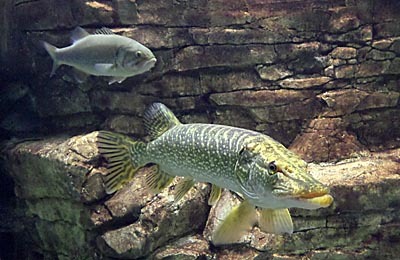 It isn’t exotic species, it’s the species that anglers encounter (or wish to encounter) right here in the mid west. 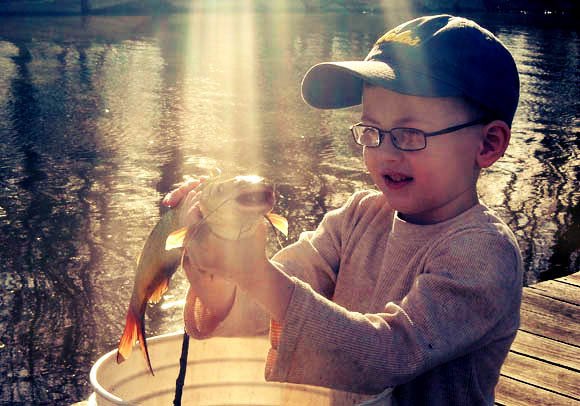 The fish vary as to what is being displayed, but usually you will find Large and Smallmouth Bass, White Bass, Yellow Perch, Bluegill, Crappie, Freshwater Drum, Northern Pike, Channel and Flathead Catfish. I have also seen Paddlefish and Longnose Gar on a few visits. Additionally, there are usually some turtles, both painted and soft-shell. It is always interesting to watch the fish in their natural habitat and how the species interact with each other. Also, I recommend checking for feeding times. Just about every time I have visited, I see something new or something interesting is happening. 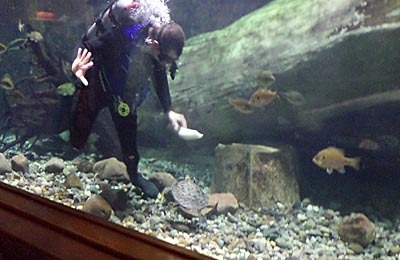 Most recently, my visit included getting to watch a scuba diver cleaning the aquarium glass. 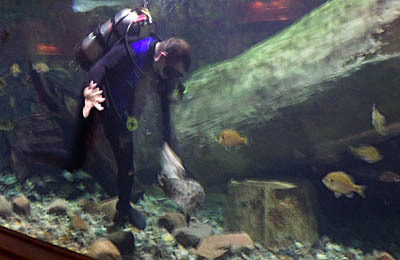 What made this particularly fun to watch was the interaction between the diver and a soft shell turtle. All of the species in the tank either stayed clear and were frightened by the diver or passed around him paying no interest. 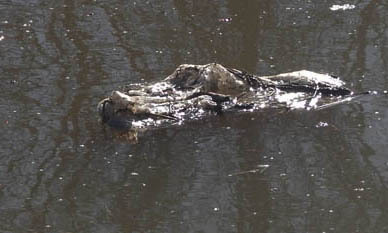 The soft shell turtle, however, took issue with him and was relentless in trying to bite him. It was hilarious watching the diver use his scrub brush like a matador’s flag against the fiercest bull. The diver would spin the turtle around and shove it away, only to have it turn around and come back at him. I watched this for at least 5 solid minutes and still wonder who finally gave in to who. It later occurred to me that I should have captured some video of the exchange, but I did take photos. Moving on from the stream and aquarium, let me get the shopping itself. As one might expect in a store of this size, you can find just about everything imaginable. This would hold true for all of the various departments in the store, but being that this is a fishing blog and that is my greatest interest – I will keep the discussion related to fishing. The section for fishing contains everything one would need for any type of fishing interest. This would include boaters, waders, shore fishing and everything from fly to ice fishing. The selection is incredible and it’s the only store I know of that I could look at a lure manufacturer’s catalog and realistically have a shot of finding the exact lure routinely. Staff are abundant and quick to ask if you need help, will nearly always walk you right to the area you need. They ask their peers if they can’t find what you are looking for and seem genuine in their desire to help you. Surprisingly, I haven’t traded fishing stories with employees which begs the question, Is it possible to ever get tired of talking about fishing? Maybe for those that work here full time and with the volume of visitors, it actually can happen. What a good problem to have, too much fishing talk. Before I get accused of sounding like a Cabela’s cheerleader or someone just looking for some perks or free swag, I do have a few areas that I am critical of. The first one is pricing. If you are specifically trying to find something for the cheapest you can find it, Cabela’s is not the place to look first. Maintaining streams, an aquarium, hiring staff with some expertise and the sheer volume of staff, powering a store of this size, etc etc… all comes at a cost. There are sales, there is a Bargain Cave, but overall their pricing is full retail most often. Because I enjoy all the things listed, I am willing to pay a little for it. I tend to look at it as I didn’t have to pay admission, so I can handle a bit more in the pricing. The only other thing that is a bit of a downfall is the tenacious way everyone is selling the Cabela’s credit card. On average, I’m asked 3-4 times by different associates if I am interested in it. Overall, I always enjoy my visits and always end up buying something(s) that I may or may not have needed. I encourage everyone to check out the official link at the top of the post as I have hardly scratched the surface of everything the store offers or has going on.